New London Seamless Gutters also installs replacement windows! Inevitably age, as well as rain, snow, and other elements, wear away components of your home. Windows need to be replaced periodically. And New London Seamless Gutters can help. Structural Integrity – multi-chambered construction results in increased strength, durability and structural integrity. 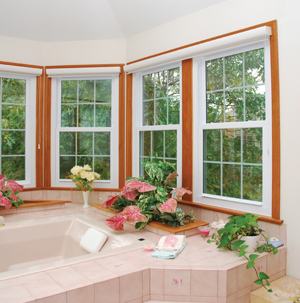 Energy Efficient Glass – specialty triple pane insulating glass! Insulation – frames and sashes are foam-enhanced to maximize energy efficiency. When looking at your gutters, check out your windows too. New London Seamless Gutters can help you with both! For more information contact us or request a quote!